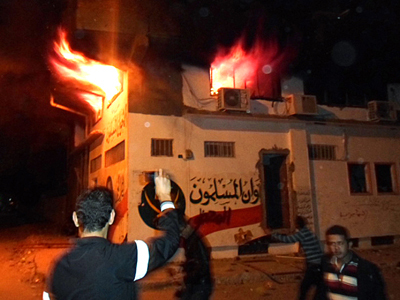 Offices used by the Muslim Brotherhood's political party were set ablaze by protesters in the Egyptian Suez Canal city of Ismailia on Friday, witnesses said. 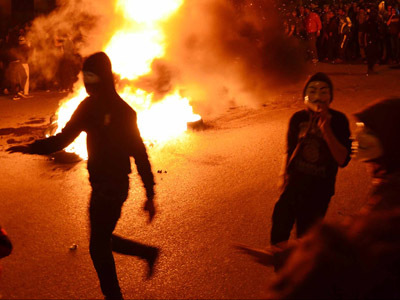 A group of youths reportedly broke into and ransacked the offices used by the Freedom and Justice Party – the Brotherhood's political arm – before setting it on fire. 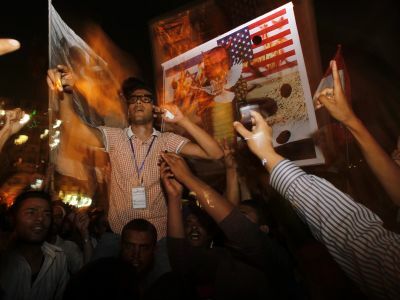 The Muslim Brotherhood said protestershad also attempted to storm one of its offices in the Cairo district of Tawfikiya. An AFP correspondent on the ground said protesters were lobbing stones at the building as local residents chased after them. The Muslim Brotherhood was founded in the north-eastern city of Ismalia in 1928. Violent protest between opponents of President Mohamed Morsi and his Islamist allies have engulfed at least three other cities across the country. 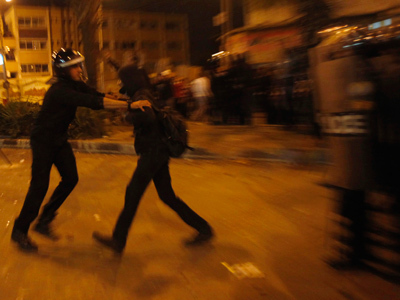 In Cairo, hundreds of demonstrators battled with police on Tahrir Square. Protesters lobbed gasoline bombs and firecrackers at police, who responded by deploying teargas. Protesters also attempted to storm the Interior Ministry, but were repelled by police. More than 50 central security forces vehicles and 12 armoured vehicles have been deployed around the Ministry of Interior, the cabinet, and the parliament, the Middle East News Agecy (MENA) reports. In Egypt’s second city, Alexandria, police sprayed teargas in an attempt to disperse a crowd waiting outside a courthouse where several officers are currently standing trial for the killing of civilians during the uprising. At least 61 civilians and 32 security personnel have been injured in the ongoing clashes. 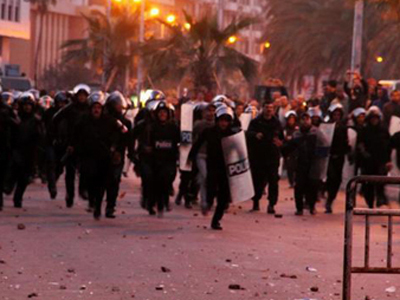 The violent demonstrations coincide with the two year anniversary of the uprising that swept Hosni Mubarak from power. The opposition has accused Morsi of betraying the revolution, a claim he has denied amidst appeals for calm. 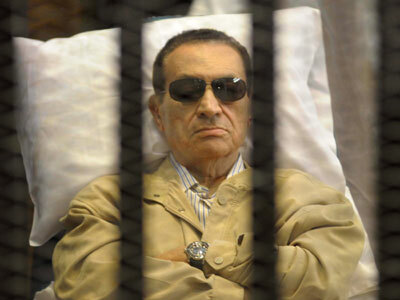 An appeals court recently overturned a life sentence for Mubarak's role in the death of protesters during the 2011 revolution and have ordered a retrail. The Brotherhood opted not to demonstrate for the anniversary, worried there would be a repeat of the violence in December which was sparked by Morsi's decision to push through a constitution with Islamist-overtones.